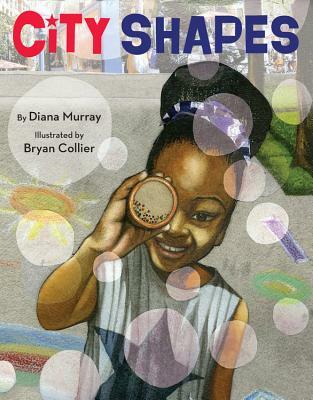 Hunt for shapes of all kinds on this journey through a bustling city, illustrated by four-time Caldecott Honoree Bryan Collier! From shimmering skyscrapers to fluttering kites to twinkling stars high in the sky, everyday scenes become extraordinary as a young girl walks through her neighborhood noticing exciting new shapes at every turn. Far more than a simple concept book, City Shapes is an explosion of life. Diana Murray's richly crafted yet playful verse encourages readers to discover shapes in the most surprising places, and Bryan Collier's dynamic collages add even more layers to each scene in this ode to city living. Diana Murray is an award-winning writer of stories and poems for children. She is the author of Grimelda, The Very Messy Witch and several other picture books. Her poems have appeared in many magazines, including Highlights for Children and Spider. She grew up in New York City and still lives nearby with her firefighter husband, two children, a goldfish, and a bearded dragon. One of Diana's favorite shapes is a blank rectangle of paper. Bryan Collier has illustrated more than twenty-five picture books, including the award-winning Dave the Potter, Knock Knock, and Fifty Cents and a Dream, and has received numerous awards, including three Caldecott Honors and five Coretta Scott King Awards. He lives with his wife and children in Marlboro, New York.